Our team of respiratory care therapists aim for the highest standard of excellence by using the advanced equipment to best treat pulmonary disorders. Numerous tests, procedures and services are available. Endobronchial ultrasound is used to diagnose lung cancer and to determine if the disease has spread to other parts of the body, including the lymph nodes. During an endobronchial ultrasound, a thin, flexible instrument called a bronchoscope is fitted with an ultrasound device and guided through the patient’s mouth and trachea. This technique provides real-time images in and around the lungs and can help identify tumors. Endobronchial ultrasounds are also used to biopsy a tissue or fluid sample from the lungs and surrounding lymph nodes of the chest. An endobronchial ultrasound provides a less invasive alternative to conventional mediastinoscopy, which is a surgical procedure requiring a series of incisions in the chest under general anesthesia. Endobronchial ultrasounds can be performed under local anesthesia in an outpatient setting. Continuous positive airway pressure (CPAP) is a treatment that uses mild air pressure to keep the airways open. CPAP is used by people who have breathing problems such as sleep apnea. Treatment generally involves a CPAP machine. The machine keeps your airway open by providing a constant stream of air through a mask you wear while you sleep. 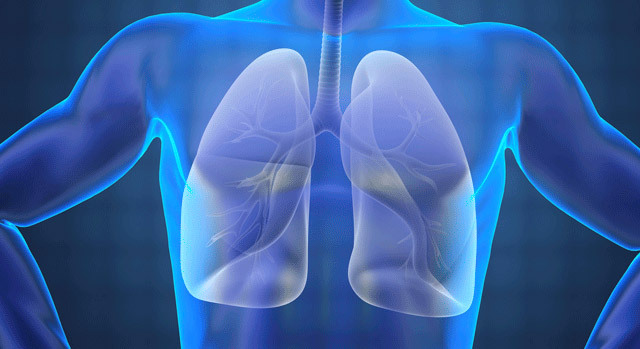 These tests measure breathing and how well your lungs are functioning. They can help diagnose many conditions including asthma and chronic obstructive pulmonary disease. They can also be used to measure treatment progress or to evaluate how medication is affecting your lungs. Bronchoscopy is a minimally invasive procedure used to view a patient's airways, including the throat, larynx, trachea and lower airways. During this procedure, a bronchoscope is passed through the mouth or nose through the trachea and into the lungs. The test can help detect lung disease, infections, cancer and more. An arterial blood gas test measures the oxygen, carbon dioxide and pH level of the blood. This test can help determine how well your lungs can move oxygen into the blood and remove carbon dioxide from the blood. Results from an arterial blood gas test can indicate a variety of conditions, including kidney and heart failure, uncontrolled diabetes, hemorrhage and more. This simple test measures a patient's oxygen level while sleeping. It is used to determine if a patient has a sleep disorder such as sleep apnea. The test can be done at home and involves wearing a plastic clip that measures heart rate and oxygen level. To find a doctor affiliated with Manatee Memorial Hospital, contact our free physician referral service at 941-708-8100.